We love American Heritage Girls. With our endless moves it has been a great way for us to meet people in a new community. It also has allowed us to try things we never would have done before. My daughter loves anything crafty. The Creative Crafts merit badge is a great way for her to try new types of skills – Bead Making. Every child out there has strung beads. However, we are a little older and cheap plastic pony beads have lost their appeal. Nice beads from the craft store can get crazy expensive. Don’t get me wrong there is a time and place for those, but there are other options. Lily designed her own beads using oven baked clay. With her knowledge of the color wheel and basic complimentary colors, she picked two blocks of Scupley Oven Baked Clay left over from the snowman kit I had made previously. 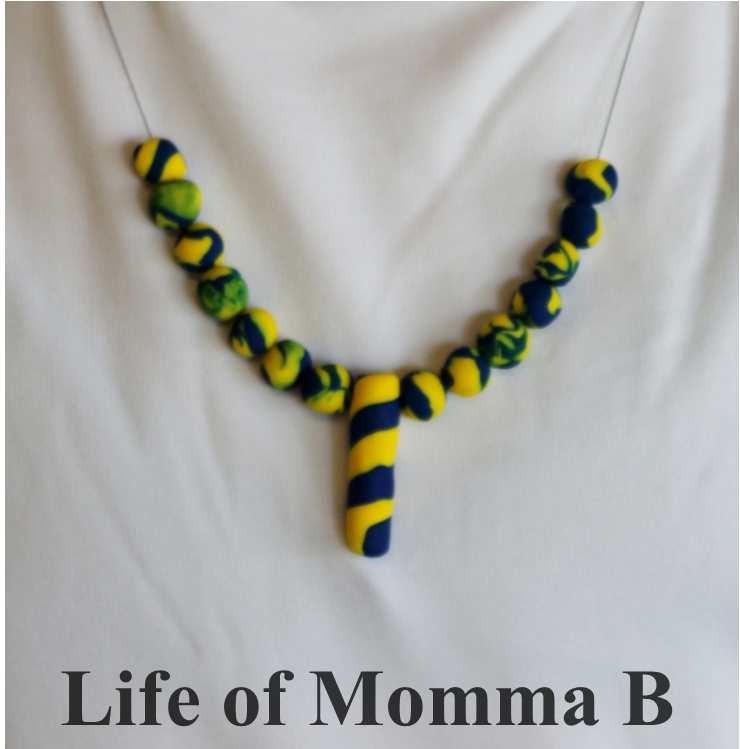 After each color was kneaded, she made a thin rope of each color. The ropes were then melded together to form a new rope. The rope looked like the center pendant. Do not over mix the colors at this point. The new rope was cut into small pieces. The pieces were then rolled into balls, this created the marbling. She worked with the small balls until it had the color blend she liked. She used a straight pin to make a small hole in each piece before baking them. The pendant in the middle is a piece of the rope. The beads were then baked according to the package directions. After the beads had cooled she used my jewelry kit to string them on a piece of jewelry wire and attach a clasp. This project can be used toward completing Creative Crafts merit badge requirements #1, 2, 6, 7, 12 and 14. If you have not learned about basic color theory this color wheel worksheet will help. This entry was posted in American Heritage Girls, Crafts and tagged AHG, Arts Frontier, beads, jewelry, merit badge, oven bake clay. Bookmark the permalink.